Hyderabadi Nawabi Mushroom is famous for its rich and aromatic nature. It's taste is very distinguishable having a liberal use of exotic spices and ghee. The Hyderabadi food uses fresh fruit instead of dried fruits.Hyderabadi cuisine is inspired by the Mughlai cuisine. What makes the Hyderabadi Cuisine special is the use of special ingredients, carefully chosen and cooked to the right degree.The Masalas or the rich blend of herbs, spices and condiments give the dishes a base, or what is popularly known as "Gravy". The word "Nawabi" is as synonymous with the Hyderabadi cuisine as "Shahi" is with Luknowi. These terms conjure delicacies that are rich in taste and texture with mouth-watering aromas. Hyderabadi Nawabi Mushroom Curry is a tasty gravy dish that makes a great accompaniment for any Indian roti (chapati, naan, plain paratha, or poori) and rice. Mushrooms are worth including in our diet plan, as they provide a lot of vital nutrients. Mushrooms provide a lot of vital nutrients and antioxidants that help reduce high blood pressure and protect cells from damage. 1.Grind the onions and the cashew nuts along with all the other ingredients under the to be grinded list . 2.Heat the ghee and fry the nut and onion paste to a rich golden brown colour,sprinkling a little water in between to prevent it from burning.Fry till ghee separates. 3.Add the garam masala , chilli powder and salt.Stir for a few seconds. 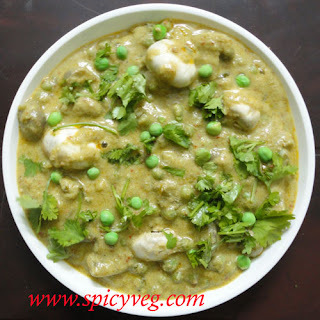 4.Add 1/2 cup water to the cashew nut paste and give it a boil.Add the mushrooms and peas.Let it cook for 4-5 minutes. 5.Add 1 cup of water and 1tbsp coriander leaves.Cook covered on low flame,till the vegetables are done. 6.Remove from fire when the vegetables are cooked and the gravy is slightly thick. 7.Serve hot,garnished with fresh coriander leaves.